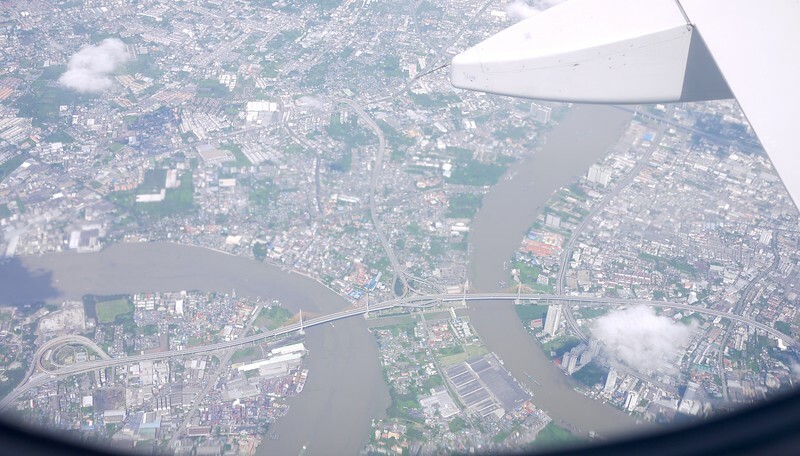 We flew out of Bangkok early Sunday morning. The heat was still strong, but not nearly as bad as it would be later that day in the city. Our taxi was stuck in traffic for a while before the driver decided to take a detour – and a good thing, too. The reason for the delay was a marathon. 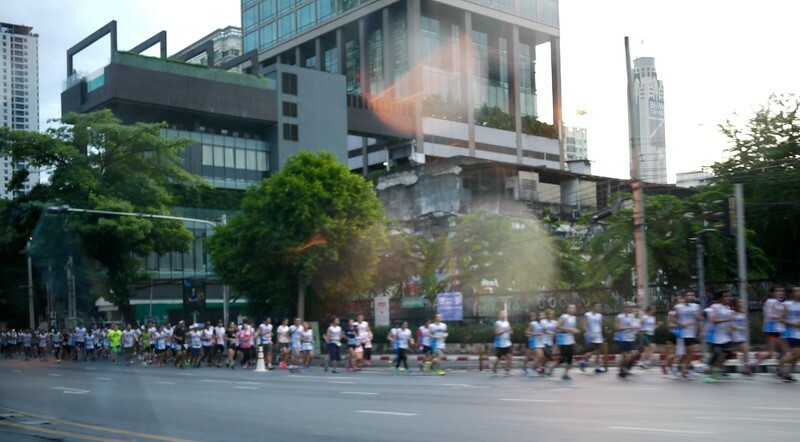 Hundreds of crazy people running in the morning heat – for fun! People are strange and I’ll never understand them. The ride the airport was quick and we were soon in line for check in. As we stood in line I noticed someone had a large flatscreen TV box on their cart. And then I saw someone else with one. Another person had two of them. All-in-all, I would say that about seven or eight flatscreen TVs were going on our flight with us. It was one of the oddest sights I’ve seen in the airport in a long time. We hadn’t been waiting long when an airport employee approached and beckoned that we follow her to the check in desk. Dan and I looked at each other, noting the dozens of other passengers still waiting in line. 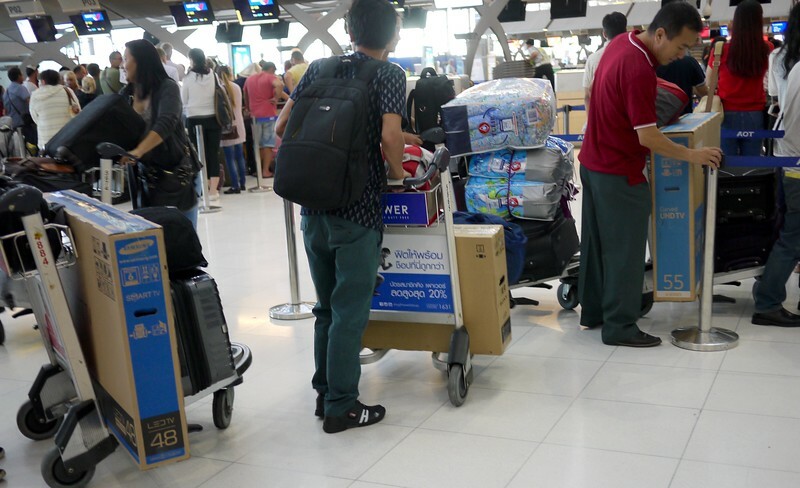 Other than not having our own TV in our baggage, there wasn’t any other difference between us and those still in line. Western privilege, perhaps? The take off and flight was uneventful. 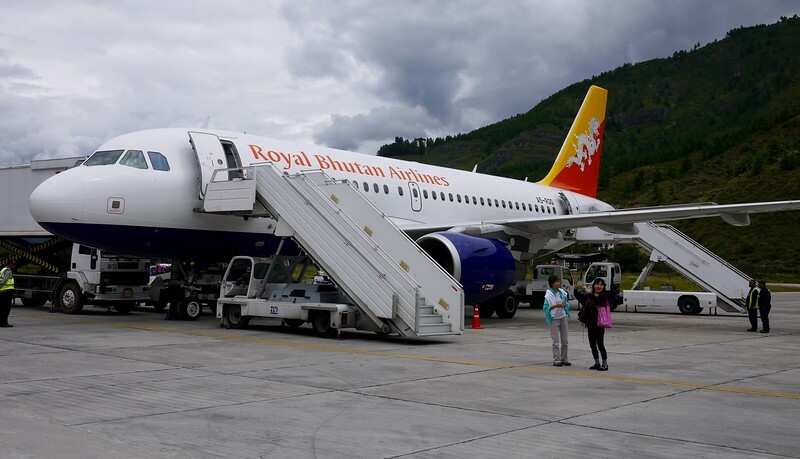 We were flying on Drukair, also known as Royal Bhutan Airlines, with our destination in Paro, Bhutan. 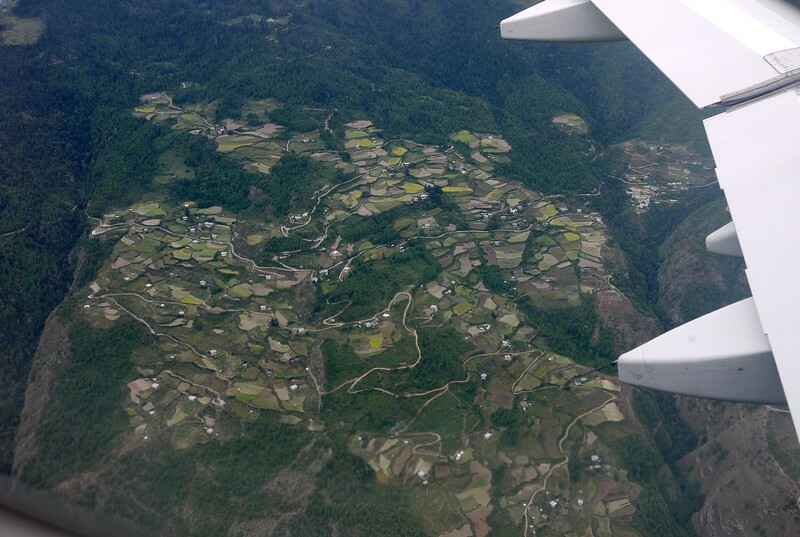 The landscape passed below the plane, often hidden by thick, fluffy clouds, but occasionally showing the face of the earth. I didn’t know our route so I could not guess at the cities and rivers I saw below. Of course that didn’t stop me from taking photos when I could! 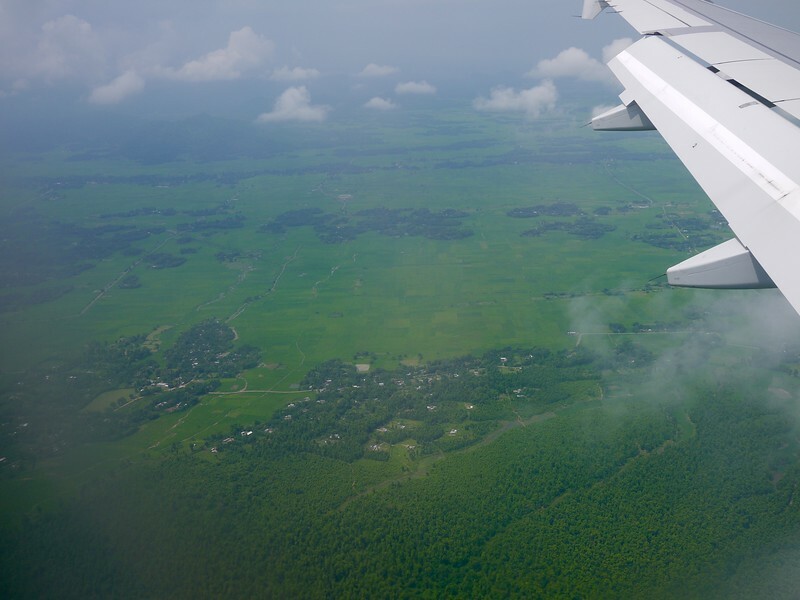 There was a quick stop in Guwahati, India for a passenger change and then we were in the air once again, heading into the mountains – and the clouds. 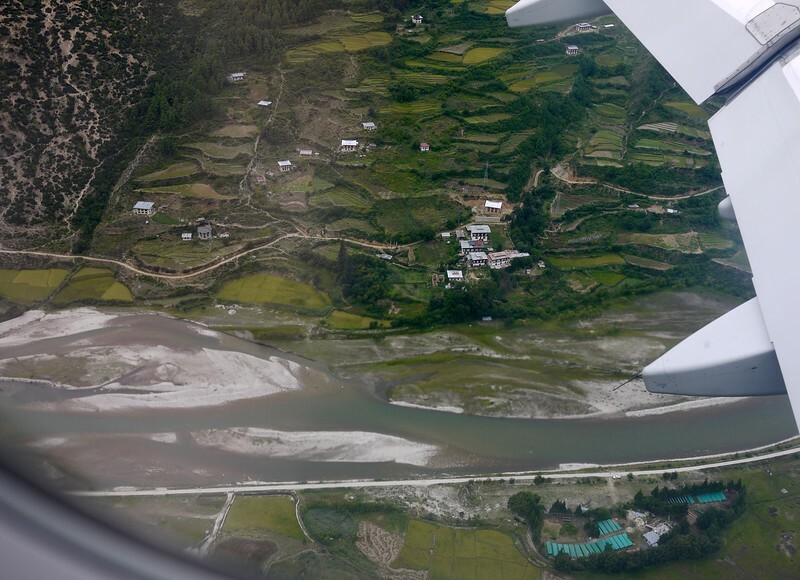 The airport at Paro is said to be dangerous and the landing is “nail biting”. I found it to be neither. Of course, the pilots are experienced and the cloud cover wasn’t too low, so that took a lot of the anxiety out of the equation. 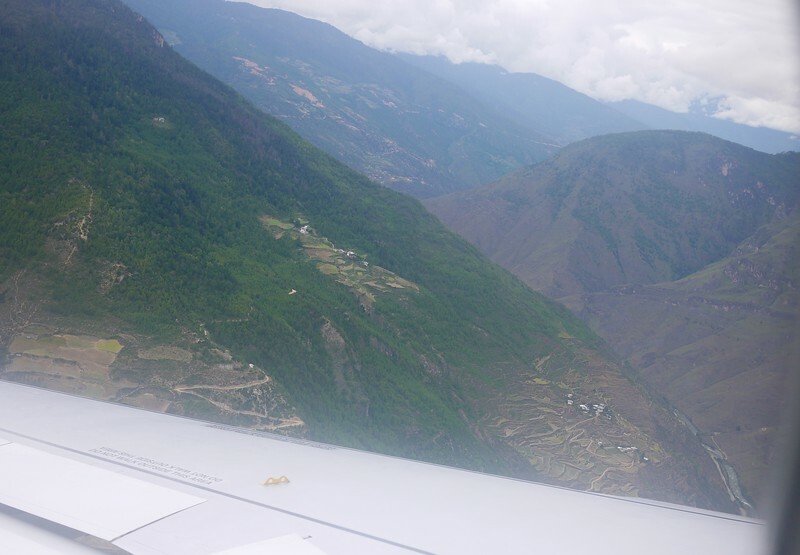 The flight paths in and out of Paro follow the valley. As the pilots only fly with VFR (Visual Flight Rules) and not IFR (Instrument Flight Rules), there needs to be clear sight lines along the valley and to the runway. 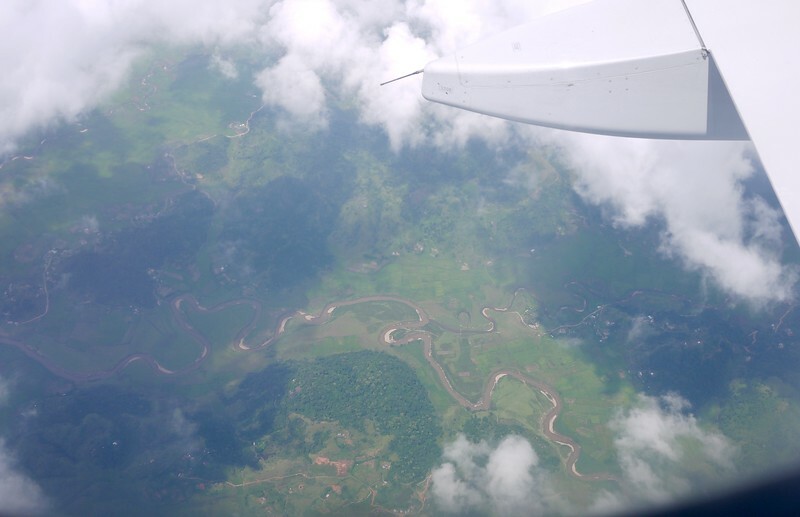 We were lucky that the cloud cover was high enough to allow us to fly along the valley, making the last-minute turn to the airport itself. The first thing that struck me after getting off of the plane was the architecture of the airport. 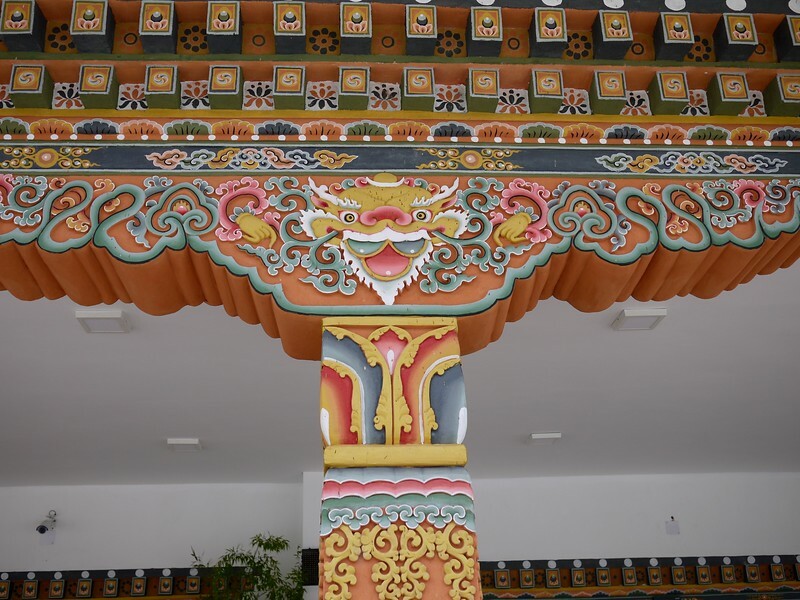 Its carefully carved and painted wood trim was like a breath of fresh air after the chaos and dreariness of Bangkok’s infrastructure. The buildings were large, but still with a human scale that made them one with the environment. 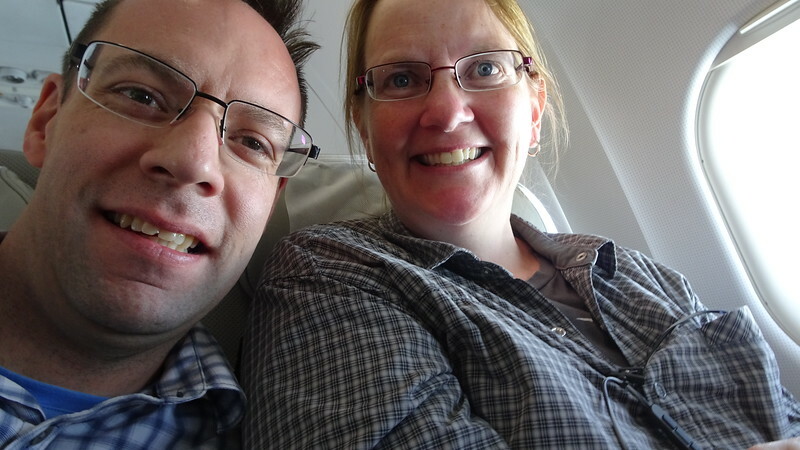 Immigration was a snap, with our visas prepared for us via G Adventures. Not just anyone can waltz into the country, and for that I am thankful. 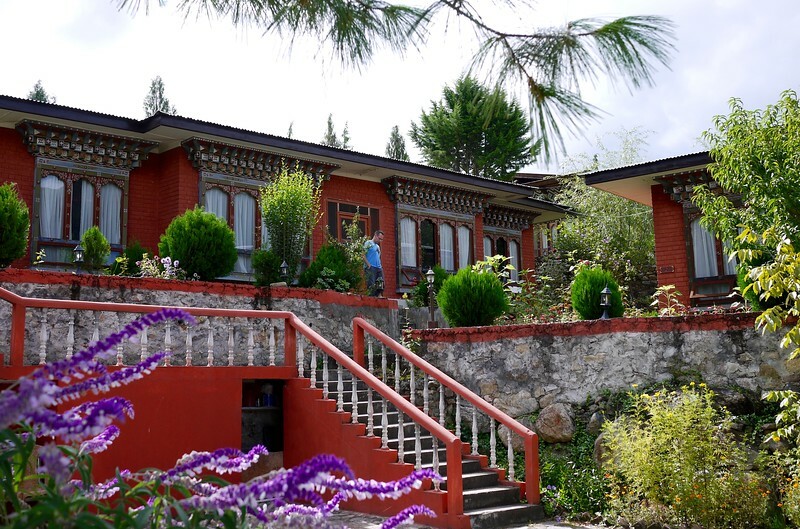 The Bhutanese government has “the policy ‘High Value, Low Impact Tourism’ in order to minimize the impact on the country’s unique society and environment. 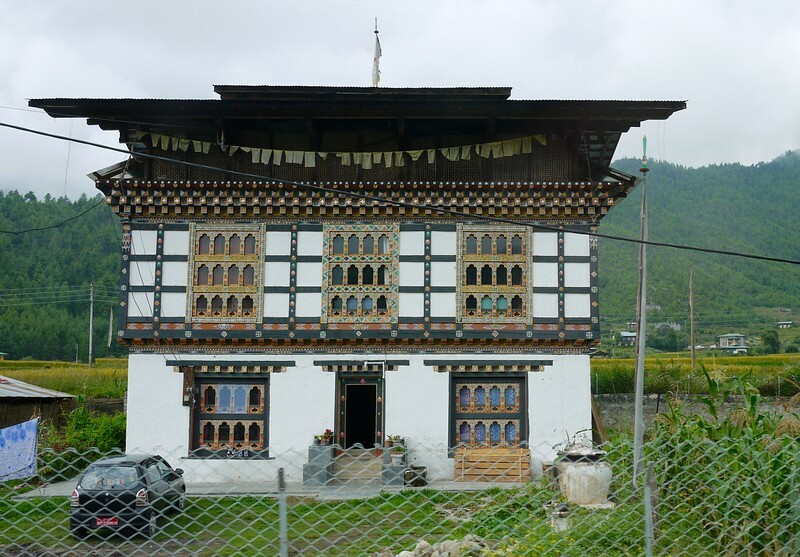 Bhutanese policy ensures that only a limited number of tourists enter the country at any one time, preventing it from being overwhelmed by mass tourism and thus altering its character, and that the tourists who do come get the most out of their visits.” – source: Wiki. This means that not only are group sizes limited, but also the number of groups themselves. 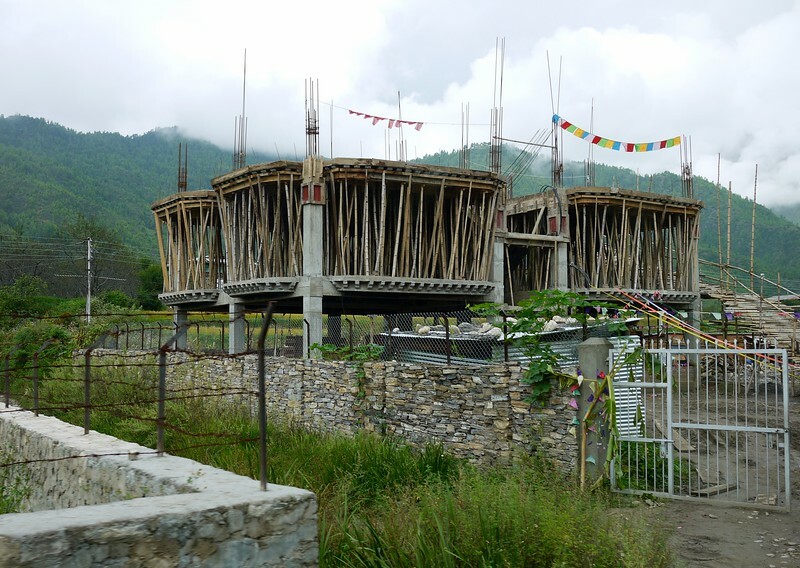 Bhutan does not want to become another tourist destination that has been ruined by the tourists themselves. 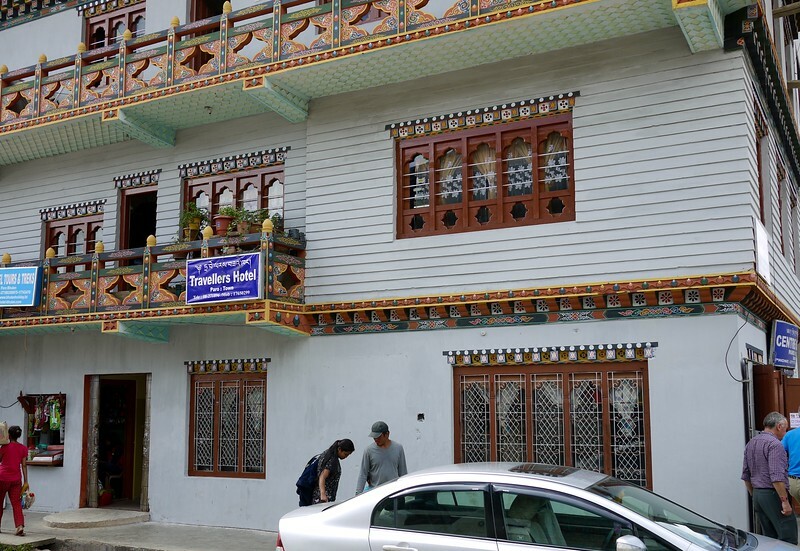 Our bags were in hand and we went out the front door to find a small group of Westerners standing around a smiling Bhutanese man. He was our guide and they were part of our tour group. We would get to know each other quite well in the coming days. There were more to come, but they would be arriving later on a different flight. In the meantime, we would head into town and have some lunch. Let the first of many rice dishes be served! 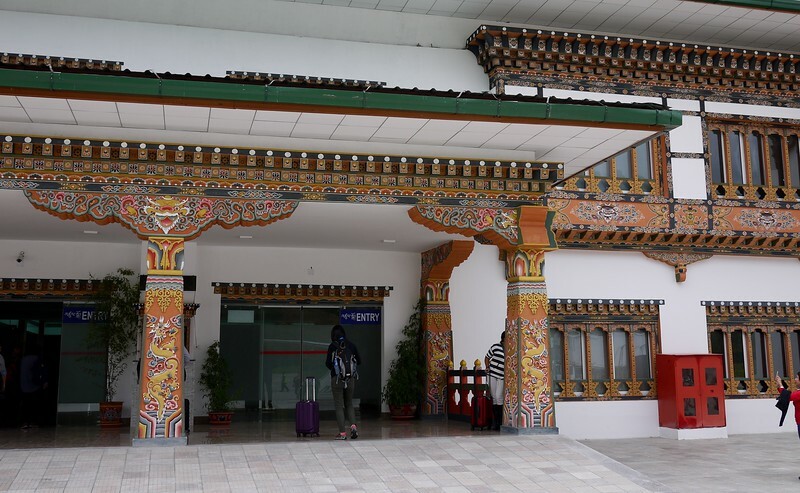 While Paro has the only airport in Bhutan, it is by no means a big place. 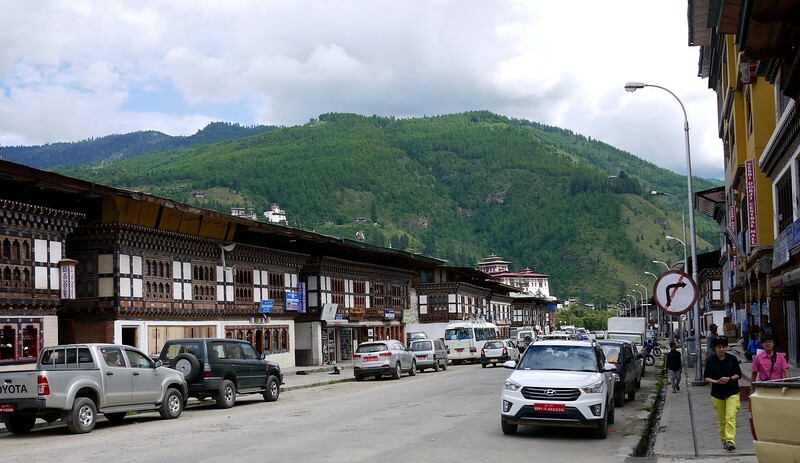 With a population of only 4,000 people, it pales in comparison to the capital city, Thimphu, which has over 100,000 population. Still, it was bustling with activity and appeared to be a healthy place to live. After lunch we hopped back onto the bus and headed out of town. What? 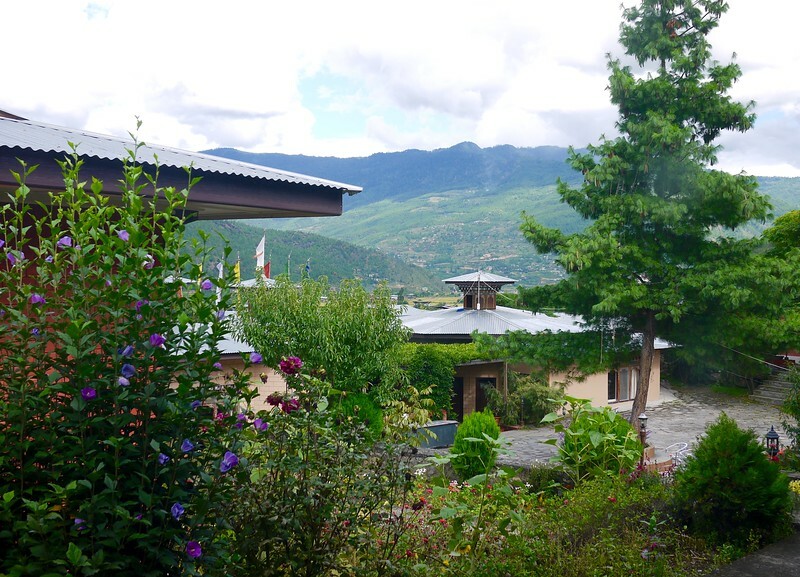 I was surprised that the hotel we would stay at was not in the town of Paro, but instead 2.5 kilometers outside of town. So much for evening walks along the town streets and doing some casual window shopping. 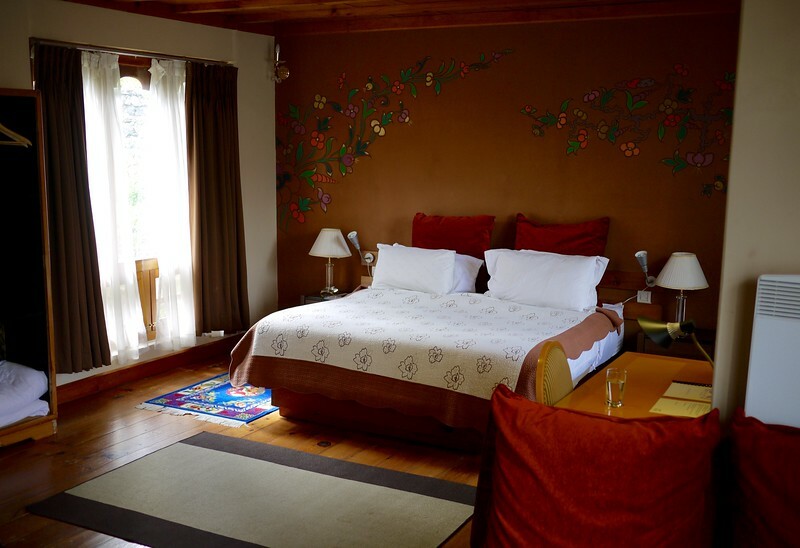 But the Metta Hotel was nice and comfortable. 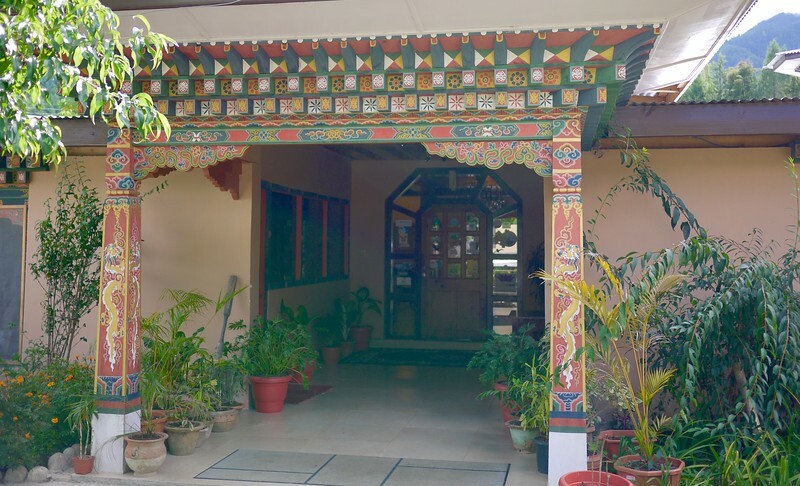 There was one main building that housed reception, the lobby, a lounge area and the restaurant, but the rooms were scattered across the grounds in separate buildings. Flowers – mostly marigolds and zinnas – filled the spaces around the buildings, although it was obvious that their season was coming to an end. It was early afternoon and there was nothing planned until dinner. I took a short walk around the grounds to see what there was to see. I was also making a serious effort to remember the names of the people in my tour group, even though I was still getting to know them since our lunch together. I am really bad with names and I wanted to change that on this trip. There was a small cat on the hotel grounds as well, and it turned out to be very friendly. The nails were sharp, but the cat kept them in check for the most part. I was missing my own cats so I was happy to have this one to distract me. 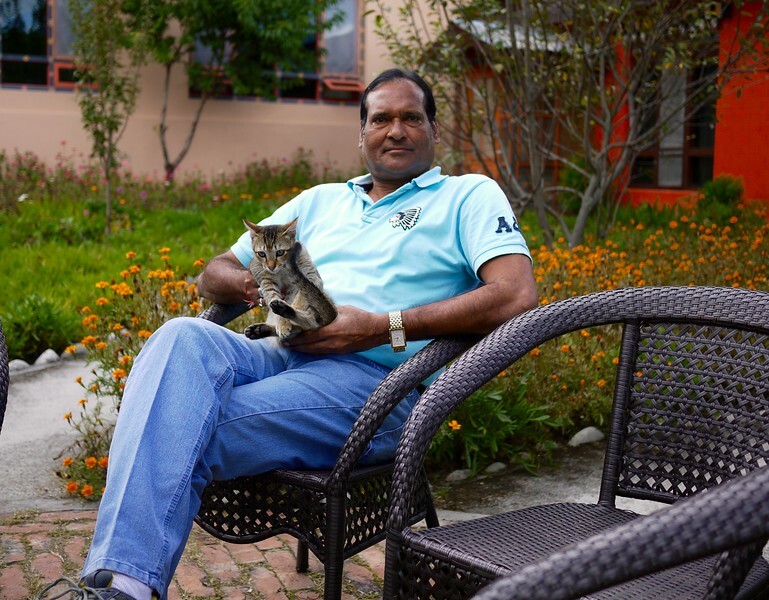 I invited him up on my lap and had just settled down for a short Cat Session when a boisterous Indian group arrived at the hotel. 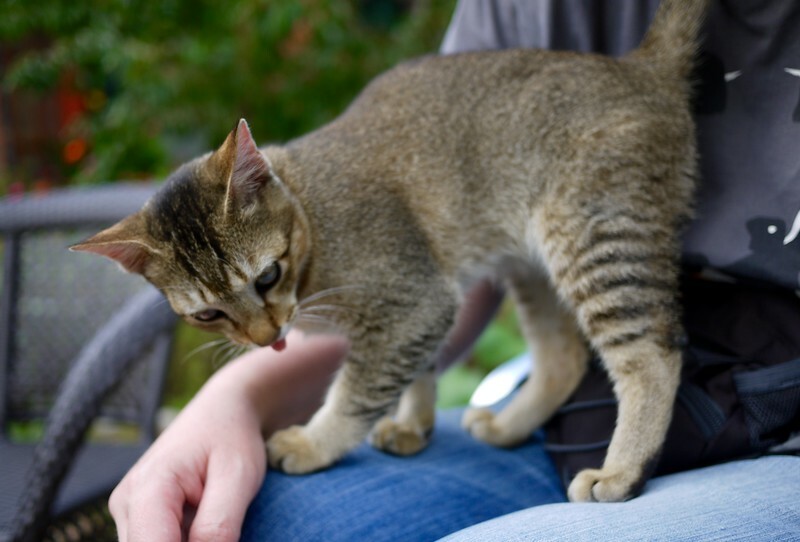 One man saw me sitting with the cat on my lap and smiled as he walked over. He said something about it being a nice cat and I smiled and said yes, it is. And then much to my surprise the man reached down, grabbed the cat from my lap and proceeded to sit down on a nearby chair with it, plopping it down on his own lap. I don’t know if I was more shocked or annoyed, but I immediately got up and left. He took my cat! The rest of our group had arrived and we all met in one of the conference rooms to have some tea and a general overview. I usually don’t care for tea, but for this trip I was going to make an effort. I drank my tea and pretended to like it. Meanwhile our guide, Chunjur, suggested that we re-arrange our schedule. 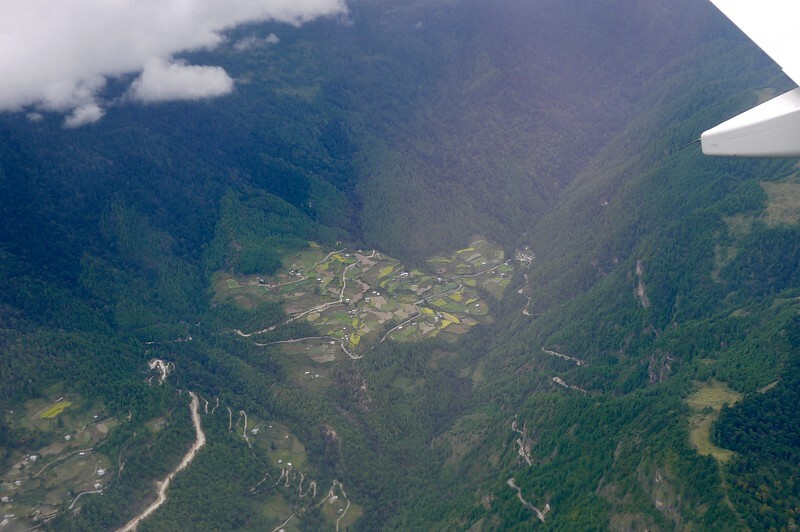 Instead of touring around Paro and the area on Monday (tomorrow), we would instead take the Big Hike up to Tiger’s Nest. 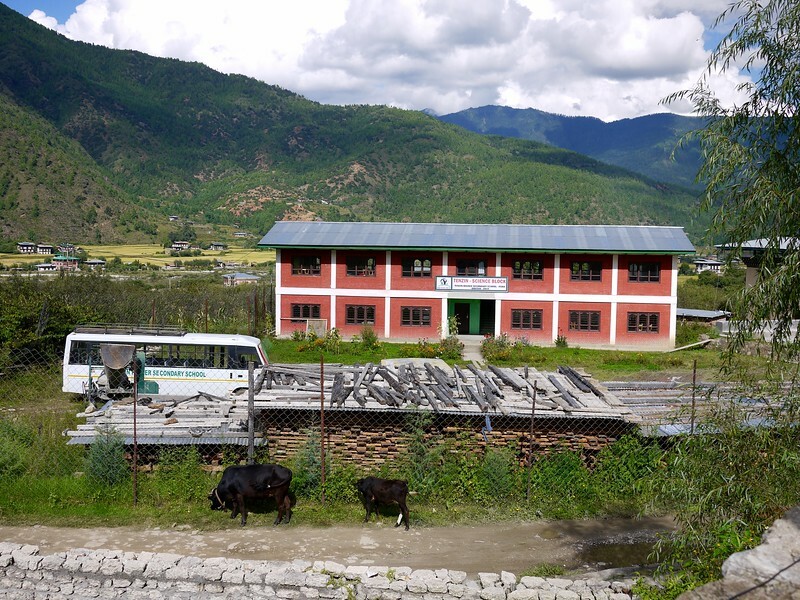 This would give us a “rest day” (i.e., the tour of Paro) before we started our multi-day trek on Wednesday. This sounded like a good idea to everyone and we prepared for Tiger’s Nest for the next day. Not that there is much preparation that can be done at this point. The rest of the evening was spent getting to know our new trekking mates and rearranging our luggage. Tomorrow the adventure would start!